Natural England is helping families get out and about this summer with a free to download activity pack celebrating a much loved tale. 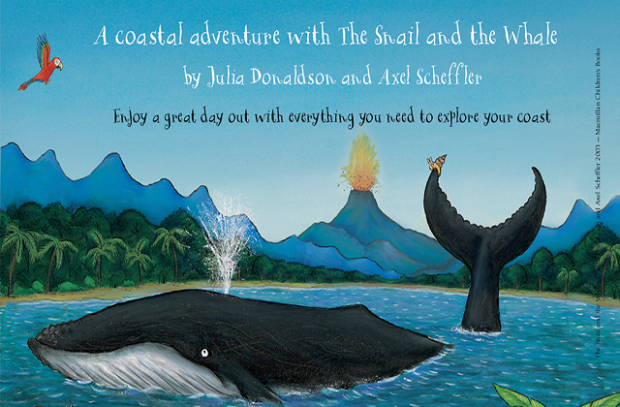 Alongside the Marine Management Organisation and Macmillan Children’s Books, Natural England is celebrating 15 years of The Snail and the Whale – a classic tale of adventure and friendship written by Julia Donaldson and Axel Scheffler. First published in 2003, The Snail and the Whale tells the story of a tiny snail who hitches a lift around the world on the tail of “a great big, grey-blue humpback whale”. Together they go on an amazing journey, learning about the natural world. Natural England is now encouraging families to do the same, with a new free activity booklet ‘The Snail and the Whale Coastal Adventure’ which helps readers explore the England Coast Path and our beaches through a mix of activities, facts and games. The England Coast Path is playing a valuable role in opening up access to our nation’s remarkable coastline. Whether you are taking a short stroll or embarking on your own long distance adventure, it provides the perfect opportunity for everyone to explore the coast’s beauty and diversity. The booklet has all the tools and information you need to explore the England Coast Path - from matching animals to their coastal homes and learning fun marine animal facts, to advice about keeping our coasts free from marine litter. The release of the Snail and the Whale booklet comes at an exciting time for the England Coast Path, with another 44 miles of beautiful coastline recently opened between Amble and South Bents. When completed the England Coast Path will be the longest continuous coastal walk in the world. The booklet is available to download now from the MMO website . There will be some special events celebrating The Snail and the Whale and this fantastic partnership later on this summer.